Phrase Express is able to keep track of virtually an unlimited amount of text blocks and can add them to pretty much any other application. When you start the program, the user interface with a variable amount of sections. When you click the Phrase Express icon which resides in the system tray, or when you use one of the pre-defined hotkeys, you can add them to your current working document. 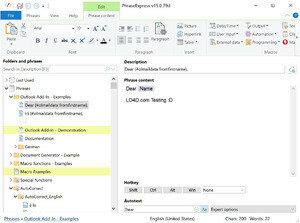 A good thing about Phrase Express is its support for HTML formatting which retains the formatting of fonts, font colors, pictures and naturally paragraph layouts. Version 14.0.131 is a freeware program which does not have restrictions and it's free so it doesn't cost anything. For security reasons, you should also check out the PhraseExpress download at LO4D.com which includes virus and malware tests. Additional screenshots of this application download may be available, too. Featuring the very best in free automation tool downloads. Editing staff adds reviews and free download links and constantly updates software. Check out some of the freeware downloads available in the automation tool category. They contain no strings and are available at zero cost.